December is one of the most festive and magical times of the year to visit Santa Fe. If you’ve been wanting to experience The City Different firsthand, then now is the perfect time to plan your escape. Boasting an average of 300 days of sun each year, Santa Fe’s blue skies will inspire those who venture here. No matter what it is you’re looking for this winter, whether it’s outdoor recreation, ample and diverse shopping, enjoyment of the arts, or a magnificent dinner at our many restaurants, when you give yourself the unique gift of a Santa Fe holiday, you are giving yourself an unforgettable adventure. Winter in Santa Fe is a magical season comparable to no other. Santa Fe’s rich and vibrant culture shines throughout the many wonderful holiday festivities that take place throughout the city. However, none of the spectacular holiday traditions are more special, nor more magical, than the annual Canyon Road Farolito Walk. Stay with us at the Four Kachinas Inn Bed and Breakfast, and marvel in the magic that surrounds you on this special night. In Santa Fe, a Farolito refers to what many other people of the world call a luminary: an illuminated votive candle in a brown paper bag. 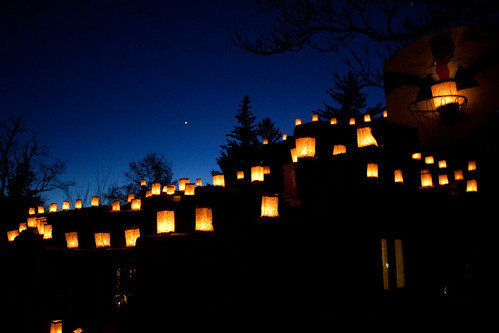 In fact, if you were to walk the streets of Santa Fe talking about luminaries, the locals might think you were referring to the bonfires that line the streets, to provide a spot to warm up as you admire the farolitos laid out in their humble bags along downtown streets and driveways. No matter what you call it, this stunning New Mexican tradition, called the Farolito Walk, has spread around the globe to enliven holidays everywhere, and is a tradition meant to mirror the purpose of the Star of Bethlehem, shining all night long on Christmas Eve to light the way for the Holy Family. If you want to participate in this years beautiful Farolito Walk–and we assure you, you do–then be in Santa Fe on December 24th for this one-night-only decorative heritage event. Picture the Farolito Walk in your mind now: Thousands of participants, carolers singing around the farolitos, and thousands of glowing farolitos at your feet, as you walk along the beautiful streets of Santa Fe. Row after row of simple brown paper lunch bags, filled with shining votive candles, are placed in decorative rows all over downtown, creating a spectacle you won’t want to miss. The walk begins, for most people, at the foot of Canyon Road at Paseo de Peralta, and winds around at Camino del Monte Sol to Acequia Madre , where the crowd thins and the walk becomes a quieter stroll through this old historic neighborhood. Make sure you have comfortable shoes and warm clothing, because this is an outdoor walk. Some galleries and restaurants along the way are open for business on Christmas Eve, providing you with the perfect respite from the cold. 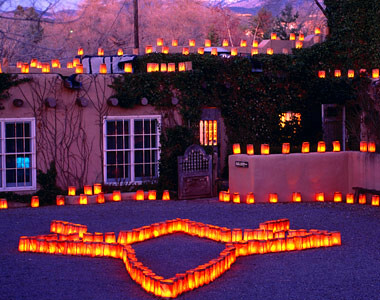 We look forward to seeing you at this year’s much beloved tradition, the Farolito Walk in Santa Fe.